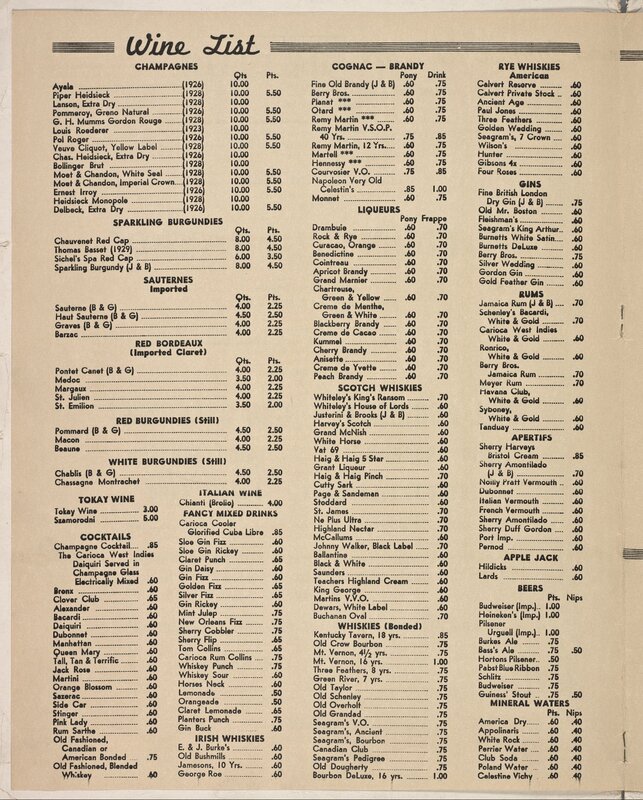 I’ve recently been spending quite a bit of time in the NewYork Public Library’s digital collection of menus. An incredible collection of documents from around the world, dating from the 1850s through the 2000s, it is fascinating to observe trends in cuisine and cocktails – and prices! 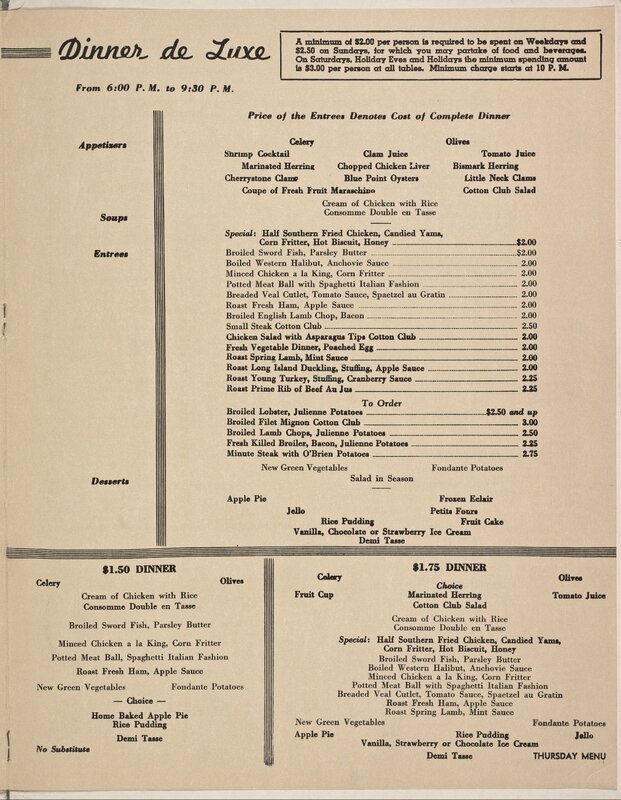 I am always the most excited to find menus from storied New York establishments, those still standing like the New York Athletic Club and Tavern on the Green, and others that have since shuttered, like this one, from The Cotton Club in 1938, when it occupied its theatre district location at 48th Street and Broadway. 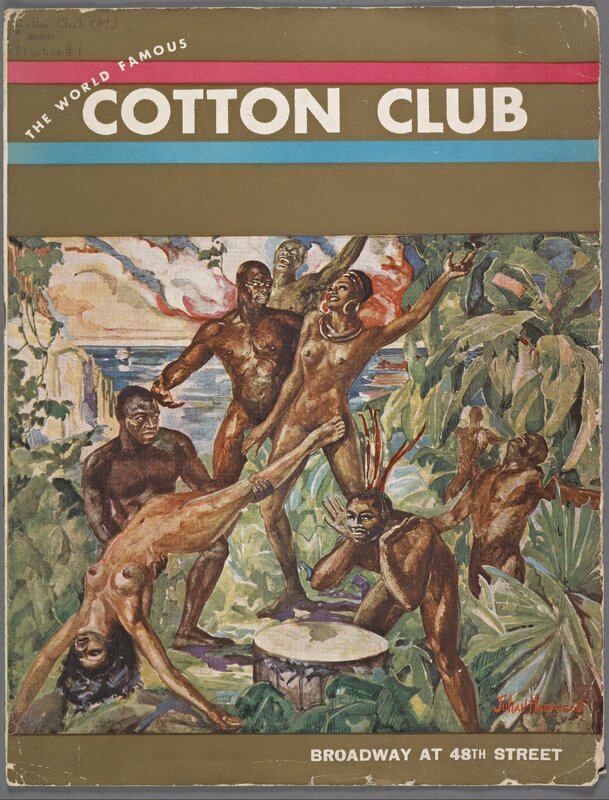 The Cotton Club was a nightclub that featured and launched the careers of some of the most notable black musicians and entertainers of the era, but served an all-white clientele. 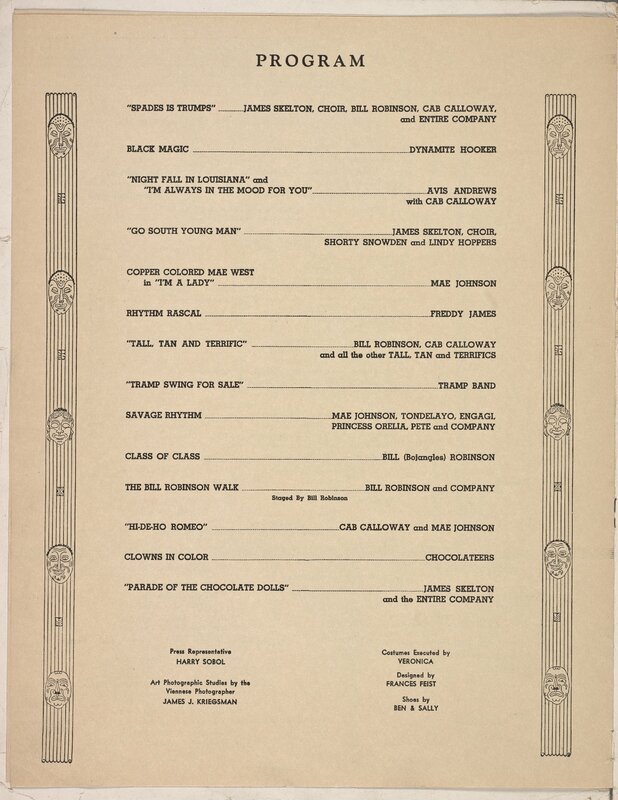 At the time of the menu, Cab Calloway and his band headlined a twice nightly musical review that frequently included overtly racist themes similar to the images on the menu cover — as you can readily observe from the show program. **Be sure to click to enlarge the images. Also interesting is the expansive cocktail menu. Most other menus in the archive from this era mention only a few classic drinks and possibly a wine list, but because its primary function was as a nightclub and not merely a restaurant, The Cotton Club’s menu features all sorts of cocktails — separated from “Fancy Mixed Drinks,” mind you. Nestled among the classics I already recognize, I was happy to find more obscure cocktails like the “Horse’s Neck,” the “Bronx,” the “Pink Lady,” and the “Jack Rose.” All of which prompted a quick search and mental note to try out in the near future. You’ll also notice a drink called the “Tall, Tan, & Terrific.” A signature cocktail if ever there was one, the phrase is a nod to the Club’s chorus girls, all of whom were required to be taller than 5’6,” light-skinned and under twenty-one years of age. To get a sense of the sort of performance patrons viewed on the nights this menu was in use, I’ve found a great short film made by Paramount in 1934 of Cab Calloway, featuring some of his most famous hits. Nicknamed the “Hi-De-Ho Man” after his success with his song “Minnie the Moocher,” you get to view a bit of Calloway’s distinctive singing style, his call and response technique with the orchestra, his inspired dance moves. Love it. I mean, his hair alone! 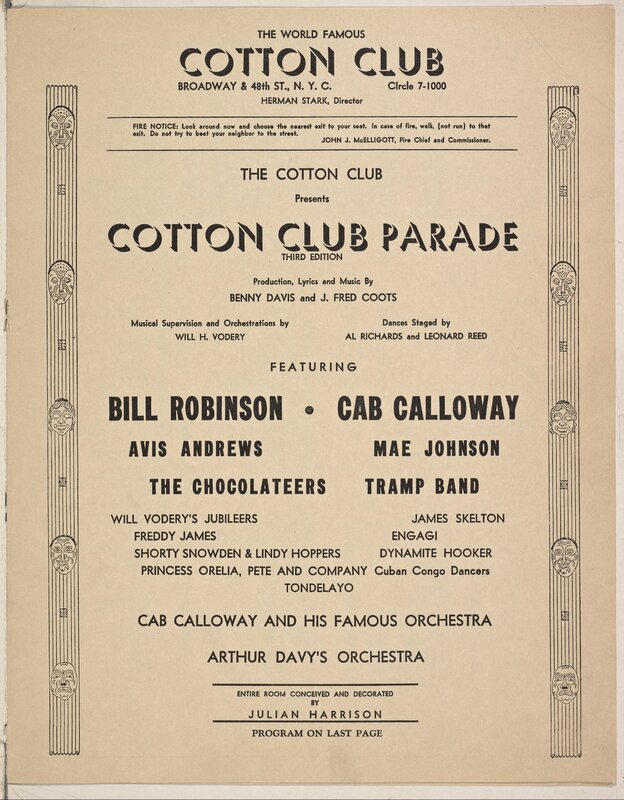 As an added bonus, a very famous clip from Stormy Weather (1943), featuring Cab Calloway and his orchestra as well as an amazing routine by the Nicholas Brothers, another act that called the Cotton Club home. I’ve always loved Cab Calloway! You are currently reading Rabbit Hole || Dinner de Luxe at The World Famous Cotton Club, 1938 at Quite Continental.